Meet Thimbles, the adorable baby attack cat! He's the puur-fect little pet with no litter box necessary! He's easy and a lot of fun to make. Your children and grandchildren will have a lot of fun with their own unique, handmade pet kitty! Or make a cute doorstop! 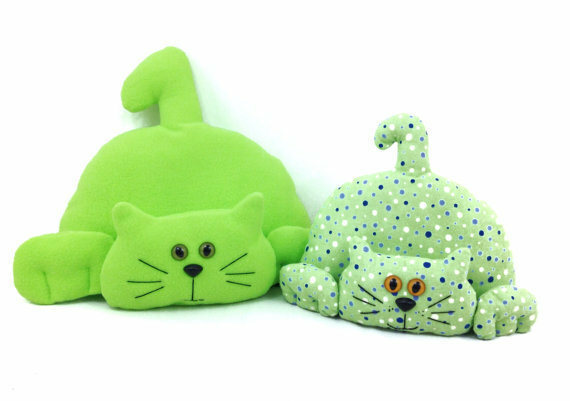 This sewing pattern includes pattern pieces and instructions to make a stuffed animal or doorstop. The pattern also includes the story of Thimbles and his mischievous ways. Do you enjoy reading to kids? Thimbles the Giant Attack Cat is a fun short story for kids. You'll enjoy reading about Thimbles as much as they love hearing the story! And then you can make them their own plush cat! A giant version of the Thimbles pattern is also available. This PDF pattern is a downloadable pattern that you can download immediately after purchase. The pattern prints full size. Just print, cut and sew! Some pattern pieces print on multiple pages due to their size so they need to be taped together. They are labeled to make taping easy. See the pattern download information page for more details.